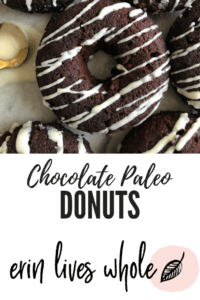 These Paleo Chocolate Donuts are moist, so rich, and healthy, you’ll never go back to Dunkin Donuts! You guys, these donuts that I made last week are NEXT level incredible. I couldn’t even believe what I had created when they came out of the oven. They seriously reminded me of Saturday mornings growing up at home and eating donuts while watching cartoons. My parents ate pretty healthy, so it was a special treat in our house. I would ALWAYS choose the chocolate cake donut with a chocolate glaze – you know that one? I’ve told you I’m a chocolate girl before so you probably saw that one coming. Typically when I make something, I make it three or four times before posting because I want to make sure it is perfect and ready to share. The first time they came out, they were so good, but of course I didn’t write down all the measurements. (Is it just me or do you all sometimes just love baking without having to be precise?) But then I remember that I run a food blog and precision is key, so back to making them for round two. Well they were just as good as I remembered, but this time I topped them with a coconut butter glaze frosting and that was the icing on the cake, no pun intended. 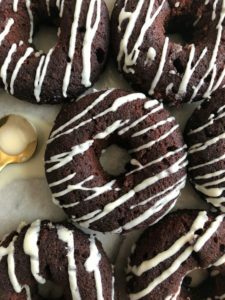 These donuts are gluten-free, dairy-free, have only natural sugars, and are baked but seriously taste like the real deal. I used a silicone donut pan because silicone is much easier to get the donuts out of. 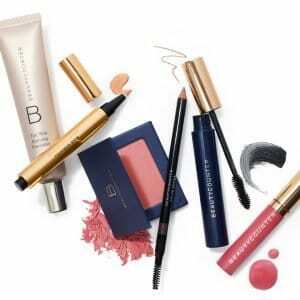 I think you will love them!! 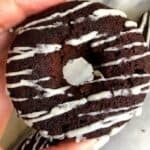 Chocolate paleo donuts that are rich, fudgy, and healthy! In a large bowl, mix coconut flour, cocoa, salt, and baking soda. Add wet ingredients to dry and stir. It will be thick. Scoop the dough into donut pan, I used my hands to help form the donuts. Bake in oven for 18-21 minutes. For the glaze, heat the coconut butter, maple syrup, and coconut oil over low heat in a sauce pan until completely melted. Add more coconut oil if you want it thinner. Drizzle over donuts once they are completely cooled.